Something has been quietly happening on Carmine Street, transforming this stretch between 7th Ave South and 6th Avenue to one of the best streets for a casual meal in the West Village. From one of New York’s most famous pizza joints to new healthy eateries this old school village street is emerging as a mini restaurant row. Morning Buzz: Small, minimal Prodigy Coffee is a friendly neighborhood spot serving coffee from Gotham Coffee Roasters, their wholesale branch in Red Hook. 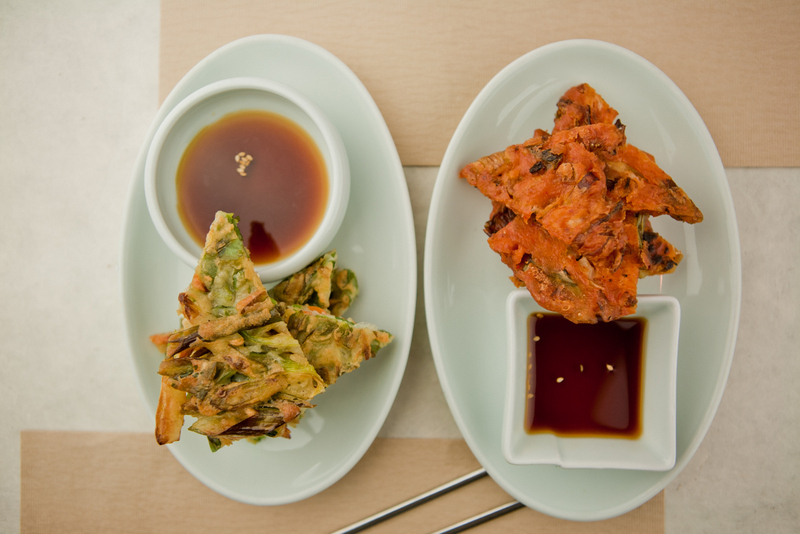 Slurp: We’ve been coming to tiny Noodle Bar for years. The stir-fries and rice dishes all look good, but we haven’t tried them as we always order the Shrimp Wonton Broth Noodles, yes, every time! Lunch specials are a good deal, served with soup or salad and taro spring rolls. They are very accommodating in substituting rice noodles for egg noodles making this an ideal gluten free spot. Noodle Bar is cash only so hit the ATM first. 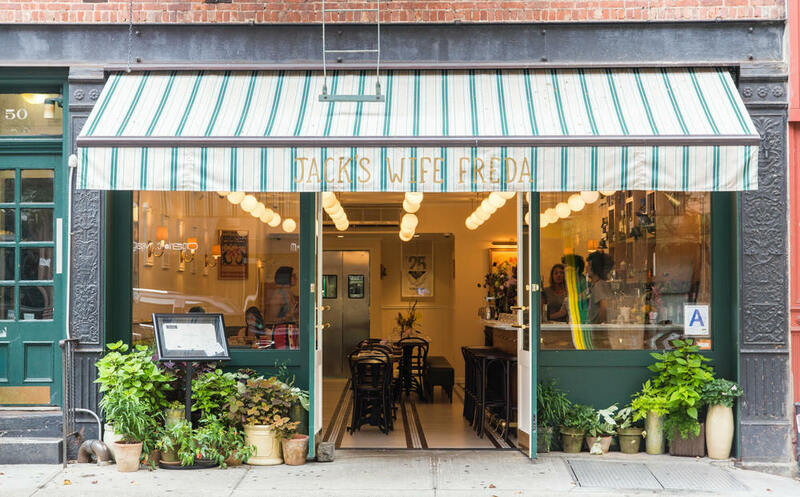 Chic Eats: Attracting an extremely fashionable crowd, just like the original on Lafayette Street in Soho, Jack’s Wife Freda is lively and buzzy all day. On the eclectic American- Mediterranean menu our favorites include green shakshuka for breakfast and matzo ball soup at lunch. This is a great addition to the neighborhood. Farm to Table: Serving seasonal American in a airy, corner spot with large windows overlooking Carmine Street, Market Table is now an old timer dating back to 2007. The kale and shaved brussel sprout salad is a constant on the menu for good reason. We admire what owner Leith Hill has created at Ellarys Greens, a neighborhood cafe with a mission to use only the highest quality ingredients, locally sourced and organic whenever possible. The menu reads healthy, but this is not a vegetarian restaurant with menu items ranging from an excellent kale salad and green juices to a chicken panini and a BLT. Sweet Intentions: Did you know that goat’s milk is lactose friendly, lower in fat than cow’s milk, and a great source of iron, calcium, protein and potassium? At Victory Garden, owner Sophia Brittan (a graduate of both the French Culinary Institute and the Institute of Integrative Nutrition) creates soft serve ice cream and frozen yogurt made only with goats milk sourced from Side Hills Acres farm in NY. Flavors and toppings change seasonally though the salted caramel, Victory Garden’s most popular flavor, is always on the menu. They also feature house made baked goods using only goats milk butter and in the winter a warming Mexican hot chocolate. Classic Pizza: Some say Joe's Pizza is the best slice in NYC, a big compliment in a pizza-loving town. This is the pizza you remember, the slices you grew up with before brick oven pizza swept the city. The crust is thin and crispy and the fast moving lines guarantee it’s always hot out of the oven. There’s just one dilemma –slice or Sicilian? Beyond Food: Eccentric finds on Carmine include independent, quirky bookstore Unoppressive Not-Imperialist Bargain Books, House of Oldies with over 250, 000 vinyl’s in stock and Carmine Street Guitars where they specialize in custom made guitars from premium and reclaimed wood. 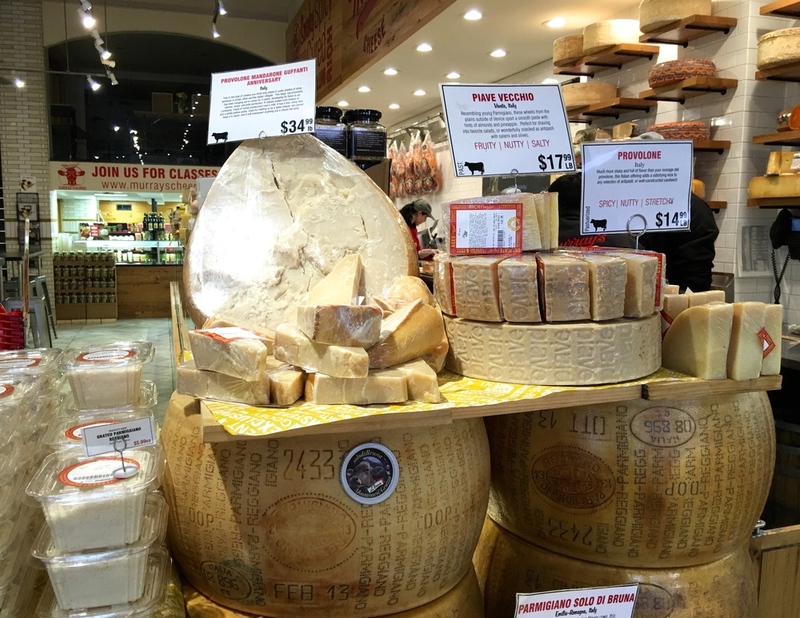 Just Around the Corner: Your just steps away from the city’s oldest cheese shop just off Carmine on Bleecker Street. Murray's Cheese is a NY Institution, dating back to 1940. The staff sure knows their cheeses and will guide you in their extensive selection. Plus there’s more than just cheese—stock up on great olive oils, vinegars, and condiments plus a full dairy case and Murray's melts to go. (The well-known breakfast melts are served till 4pm.) The newest addition is Murray's Cheese Bar, just 3 doors down, a full service restaurant serving lunch, brunch and dinner with everything cheese from fondues, to grilled sandwiches, to burgers and more.